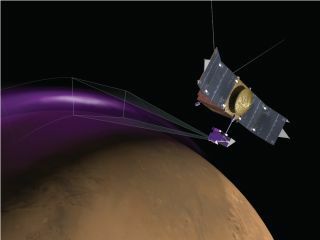 Artist’s illustration of MAVEN’s Imaging UltraViolet Spectrograph instrument observing the “Christmas Lights Aurora" on Mars. MAVEN's observations show that auroras on Mars are similar to those on Earth but have a different origin. Earth doesn't have a monopoly on celestial light shows in the night sky. Mars has them, too. NASA's MAVEN spacecraft (short for Mars Atmosphere and Volatile Evolution) spotted ultraviolet "Christmas light" auroras dancing in the Red Planet's atmosphere for five days leading up to Dec. 25, 2014. NASA officials announced the Mars aurora findings on Wednesday (March 18) — one day after much of the Northern Hemisphere here on Earth was treated to a dazzling auroral display caused by a powerful solar storm. Earth's auroras result when charged particles from the sun slam into molecules in the atmosphere, generating a glow. The lights generally occur at high latitudes because Earth's magnetic field funnels the solar particles toward the planet's poles. The Martian lights are also probably caused by solar particles, NASA officials said. Map of auroras on Mars detected by the Imaging UltraViolet Spectrograph instrument aboard NASA's MAVEN probe in December 2014. The aurora was widespread in the Red Planet's northern hemisphere. "MAVEN's Solar Energetic Particle instrument detected a huge surge in energetic electrons at the onset of the aurora," they wrote in the same statement. "Billions of years ago, Mars lost a global protective magnetic field like Earth has, so solar particles can directly strike the atmosphere. The electrons producing the aurora have about 100 times more energy than you get from a spark of house current, so they can penetrate deeply in the atmosphere." MAVEN has seen other interesting things in the Red Planet's air recently as well, including a mysterious dust cloud that reaches high into the atmosphere. The wispy cloud extends from about 93 miles (150 kilometers) above the Martian surface up to an altitude of 190 miles (300 km), NASA officials said, and has been present ever since MAVEN began its science operations in November 2014. Researchers don't know what's producing the thin cloud, which was detected by MAVEN's Langmuir Probe and Waves instrument. The dust could be coming from the Martian surface, the Red Planet's moons Phobos and Deimos, dust moving in the solar wind or debris shed by comets, researchers said. "If the dust originates from the atmosphere, this suggests we are missing some fundamental process in the Martian atmosphere," said Laila Andersson, of the University of Colorado's Laboratory for Atmospherics and Space Physics in Boulder. The dust cloud does not pose a danger to MAVEN or any other Mars-orbiting spacecraft, NASA officials said. Scientists are presenting the dust cloud and Mars aurora results at the 46th Lunar and Planetary Science Conference, which runs from Monday through Friday (March 16 to March 20) in The Woodlands, Texas.